On St. Patrick's Day, March 17, 1937, they flew the first leg from Oakland, California to Honolulu, Hawaii. In addition to Earhart and Noonan, Harry Manning and Hollywood stunt pilot Paul Mantz (who was acting as Earhart's technical advisor) were on board. Due to lubrication and galling problems with the propeller hubs' variable pitch mechanisms, the aircraft needed servicing in Hawaii. Ultimately, the Electra ended up at the United States Navy's Luke Field on Ford Island in Pearl Harbor. The flight resumed three days later from Luke Field with Earhart, Noonan and Manning on board and during the takeoff run, Earhart ground-looped. The circumstances of the ground loop remain controversial. Some witnesses at Luke Field including the Associated Press journalist on the scene said they saw a tire blow. 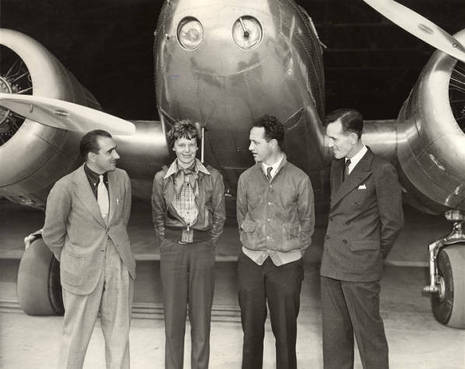 Earhart thought either the Electra's right tire had blown and/or the right landing gear had collapsed. Some sources, including Mantz, cited pilot error. With the aircraft severely damaged, the flight was called off and the aircraft was shipped by sea to the Lockheed facility in Burbank, California for repairs. Her first attempt at the world flight began on March 17, 1937, in Oakland, California, but ended abruptly with a runway crash in Honolulu, Hawaii, after a tire blew and a shock absorber on the landing gear failed. Earhart decided to repair the damaged plane and try again. The flight began again on May 20, 1937, this time heading from Oakland to Miami, Florida. But it was plagued with mechanical problems along the way that resulted in further delays. Eventually she and Fred Noonan, her navigator, reached Miami and made final adjustments to the plane's engines and instruments. Finally, Earhart and Noonan were ready to depart. Earhart's flight would not be the first to circle the globe, but it would be the longest, 29,000 miles, following an equatorial route. On March 17, 1937 she flew the first leg, from Oakland, California to Honolulu, Hawaii. As the flight resumed three days later, a tire blew on takeoff and Earhart ground-looped the plane. Severely damaged, the aircraft had to be shipped back to California for repairs, and the flight was called off. 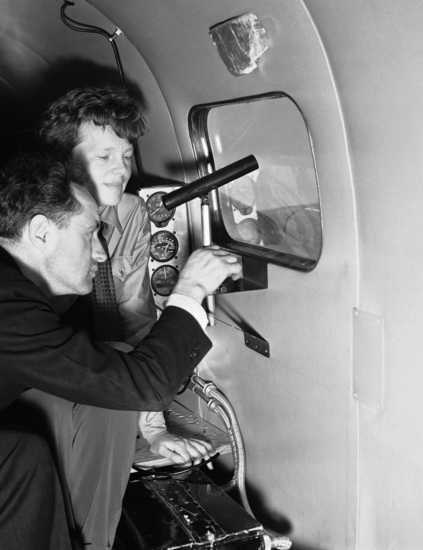 The second attempt would begin at Miami, this time to fly from West to East; Fred Noonan, a former Pan Am pilot, would be Earhart's navigator and sole companion in flight for the entire trip.